63 days to go until the 2019 Canada Winter Games in Red Deer get underway. Today we welcome the U18 Women's Team Sask Hockey crew! 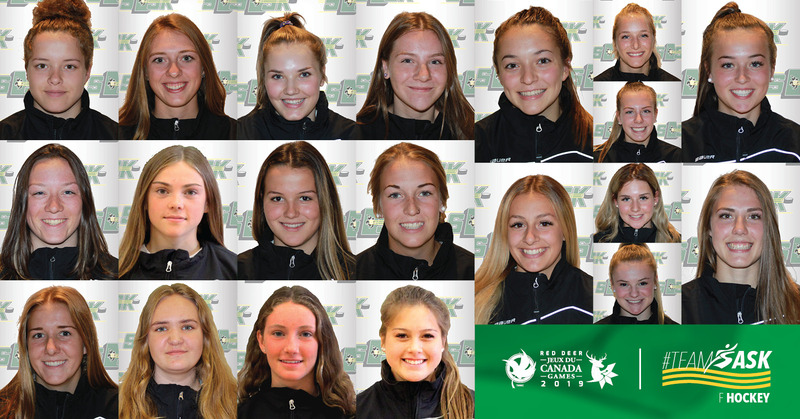 Team Saskatchewan on the Women’s side will include eleven returning players from the 2017 National Women’s Under-18 Tournament. Those players include Allison Hayhurst (Wapella), Grace Tam (Saskatoon), Kate Ball (Saskatoon), Kennedy Bobyck (Regina), Joelle Fiala (Clavet), Miranda Heidt (Saskatoon), Kaitlin Jockims (Saskatoon), Anna Leschyshyn (Grasswood), Taylor Lind (Shaunavon), Jayda Sachs (Warman) and Grace Shirley (Saskatoon). Shirley was recently named to the Team Canada Women’s U18 team heading to the IIHF Women’s U18 World Championships this January. Team staff for the Female Under 18 team is Joel Houseman (Director of Operations), Terry Pavely (Head Coach), Greg Slobodzian (Assistant Coach), Tegan Schroeder (Assistant Coach), Jean Fauchon (Video Coach), Blaine Stork (Head Scout), Kacey Moffat (Athletic Therapist) and Josh Houseman (Equipment Manager). Women’s Ice Hockey was first introduced at the 1991 Canada Winter Game in Charlottetown, P.E.I.. Since its inception, Team Saskatchewan has always represented. Two (2) medals have been claimed by the green and gold, the first being Silver in 1995 and the second being Bronze in 2003. Most recently, Saskatchewan’s Female Hockey program finished 4th place at the 2015 Canada Winter Games. Women's Hockey will take place from February 24 - March 3 at three Red Deer venues: Centrium, Downtown Arena, and Kinex Arena. Team Sask will open their tournament in Pool A against Team Manitoba. Tickets can be purchased here.